A Painting with a Storied Past "The Battle of Minden" will be on display at W&L through the end of Fall Term 2017, when it will return on loan to Mount Vernon. 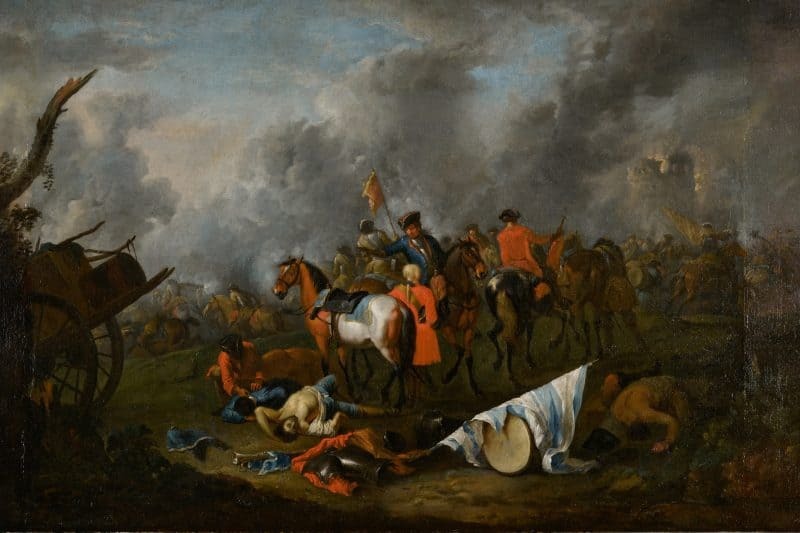 “The Battle of Minden” is a large oil painting owned by W&L and often displayed on loan at Mount Vernon. Washington and Lee University has been reunited with “The Battle of Minden,” a large oil painting that passed through the ownership of both George Washington and Robert E. Lee — and survived an invasion, an explosion and a dunking. The painting by Johann Gerhard Huck is part of Washington and Lee University’s legacy art collection gifted by the Lee family in the early 20th century. It depicts a notable British victory over the French in 1759 during the Seven Years War. It will be on display at W&L through the end of Fall Term 2017, when it will return on loan to Mount Vernon. The painting was a gift to George Washington in 1787 from Samuel Vaughan, an English merchant and political activist who met Washington in Philadelphia in 1783. It is part of an ensemble that Vaughan gave Washington for his New Room at Mount Vernon, along with a large marble mantel and a three-piece Worcester garniture (a set of decorative vases). Washington later moved the painting to the downstairs bedchamber at Mount Vernon. Following Washington’s death, the painting remained at his home with his widow, Martha, who later bequeathed “all the family pictures of every sort” to her grandson, George Washington Parke Custis. His daughter, Mary Anna Randolph Custis (Mrs. Robert E. Lee), inherited them in 1859 with Arlington plantation. In 1861, as Federal troops were approaching Arlington, Mrs. Lee packed her valuables, sent her paintings to Ravensworth plantation in Fairfax County, and left Arlington. The plantation was seized and occupied, and Mrs. Lee never returned. A decade later, the family paintings were shipped by packet boat from Ravensworth to Lexington — but an explosion caused the boat to sink, submerging the paintings in water. They were rescued and reunited with Mrs. Lee; however, several paintings were sent to Baltimore for restoration. As part of the national bicentennial celebration, W&L loaned “The Battle of Minden” to Mount Vernon, where it remained for years. In 2015, during renovation of the New Room, the university and the Mount Vernon Ladies Association agreed to jointly fund conservation of the painting. During initial examination, conservators at the Richmond Conservation Studio found evidence to support the painting’s physical history: vertical losses from being rolled while off its stretcher (probably when it was sent to Ravensworth for protection), water damage that supports the assumption that the painting was on the boat that sank on its way to Lexington, and a 19th-century replacement stretcher that is evidence of early restoration of the painting. “The Battle of Minden” returned to campus in March. It is on view in the Watson Galleries until mid-June. It will then be on display in Washington Hall through Fall Term 2017 before returning on temporary loan to Mount Vernon.